So the wonderful GirlZootZilla wrote me a letter spread out over a bunch of postcards - what an awesome idea! 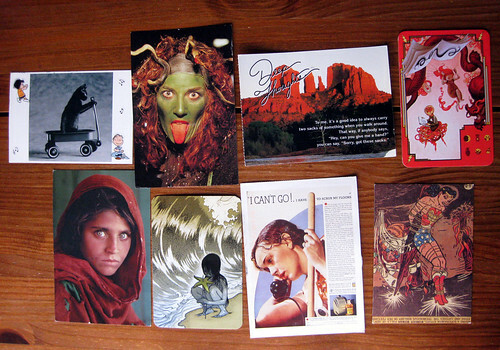 She did a blog post about it in a much more timely fashion, so check out her fine Postcard letter post to see better photos of all the postcards (two hadn't yet arrived when I took this photo, and I realized just now that I have the Wonder Woman postcard upside down). Great fun! I am so in love with that kitten in the wagon. yep gotta love the wonder woman . i recently discovered your blog through a link from Jen Lee/Life Unfolds blog and i love, love LOVE what you're doing here! i even hope to send a proper 'thank you' for sharing what you do and who you are - it's so inspiring!! Clever! I've used misc. 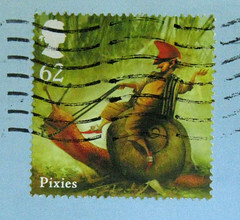 postcards as pages of a letter, but mailed in an envelope. It's a great way to use up all those touristy postcards one gets while traveling but neglects to send (or is that just me?). Creative Beast - thanks so much for the compliments! I'm so glad I can help inspire more letter-writing. Thanks, Marianne, I look forward to it.